Holy cow! 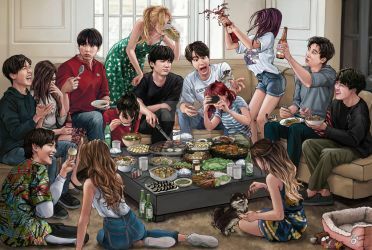 Your BTS Fanart is amazing!! Please continue it! Just an idea for the future you don't have to do it but you can if you want! You could do some got7 Fanart it would be awesome!! Once again this is just an idea you don't have to do it if you don't want to! Your BTS fanart is so fantastic!!!!!! Pls, I begging you for continue this amazing arts with Bangtan Boys *------* And, it's just a idea, but Monsta X, you know them? Arts with them wil be soooooooooooooooooo awesome too. Sorry for my bad english. You are amazing!!!!!!!!!!!!!! !